Bringing together over 3,500 key quotations, The Lion Bible Quotation Collection is an anthology of wisdom and spiritual reflection. It includes great sayings dating back from the time of Moses & the Hebrew Prophets through to Jesus & the Apostles. 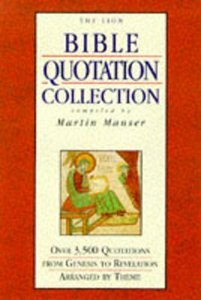 About "Lion Bible Quotation Collection"
Martin Manser (www.martinmanser.com) is a professional reference-book editor, who since 1980, has compiled and edited Bible reference material and English-language dictionaries. He has been involved for many years in a Baptist church in his home town of Aylesbury, England, and is married with a son and a daughter.